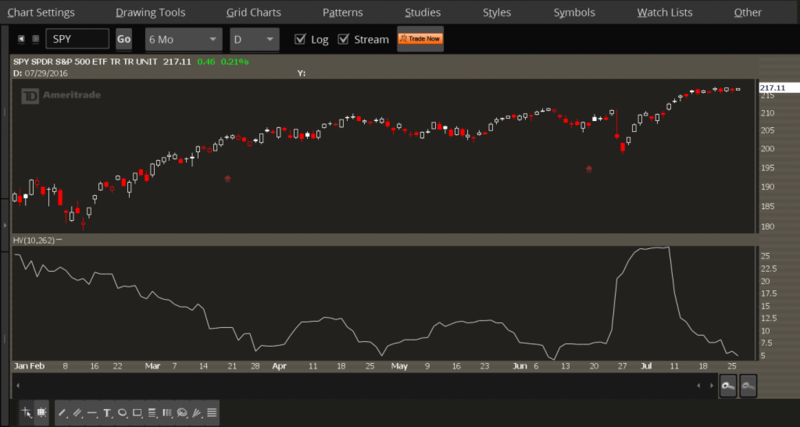 This chart shows the S&P 500 etf (SPY), and the lower indicator is the 10 day historical volatility. It currently sits around 5%. That means if we were to continue to see this kind of price action, we should expect the S&P 500 to be about 5% higher or lower from these prices in about a year. Of course, that doesn't happen, as volatility cycles from low to high... but it has been a grind. So we've got the actual vol at 5%, and the VIX under 12% for some time. The "traditional" response here is that it means we are due for a selloff.... that when the VIX is low and the market hasn't moved in a while it clearly means it's time to be bearish. I'd like to point out that from what I can tell this is the consensus. And that the true contrarian bet is actually looking for more upside. It would be nice to see a pullback. I would prefer it. But the other scenario here is that vol comes off the floor but it's not the end of the world. And instead of seeing vol head back to 20%, it just normalizes to 12%. Here's the beauty of this kind of market. When vol is low, it also means correlations are low. It's a stock picker's market. The indexes can rotate and go sideways and pullback... and in the meantime you can have setups underneath the surface trigger. Both to the long side and short side. What this means is-- don't get lost in the noise. Way to many people are getting sucked in looking for a market top and the next big macro move, when the better edge is to look for stocks moving after earnings and placing your bets there.